VR is gaining mainstream acceptance, but it's still not there yet. It's still got some problems, including motion sickness and not-so-great field of views. Pimax wants to solve those problems with its new 8K VR headset, the Pimax 8K. On Kickstarter now for $499, the Pimax 8K features a 200-degree field of view, closer to the human field of view of 220, and 2 3840x2160 resolution displays. That means the Pimax 8K is packing a whopping 16.6 million pixels. For one thing, this means the "screen door effect", which is when you can see the lines in between pixels on the display, will not be as pronounced. By the way, that whopping 16.6 million pixels is a tremendous amount more than the 1 million pixels Oculus Dev Kit 1 sported. As you can see in those post from developer Robert McGregor, the difference up close is apparent. All of this allegedly means that Pimax can get rid of VR's problems. The company says it's totally gotten rid of motion sickness, and that you'll be able to use your peripheral vision in VR for the first time thanks to its larger field of view. Using your peripheral vision means you can get even more immersive experiences, as the darkness of the headset isn't closing off your view. Plus, you won't have to move your head as much. 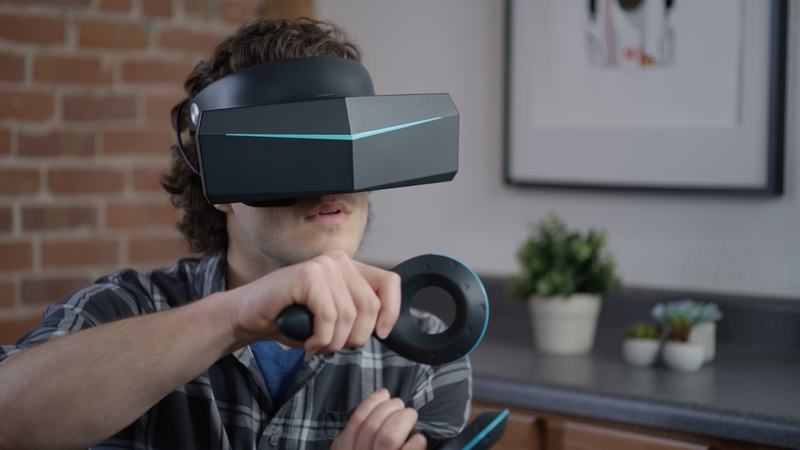 Pimax has also developed what it calls Brainwarp, which it says renders and displays all those pixels in an order that helps eliminate motion sickness and latency issues. It does that by doing fancy technological things like display a single 4K image at 150 to 180 times per second while users will perceive that as 8K at 150 to 180 times per second with a high frame rate. This trick, which essentially doesn't allow the Pimax to fully overwhelm you with high quality images all at once, also reduces GPU strain because it's using a shortcut. Pimax 8K also supports both outside-in and inside-out tracking, with the user being able to switch between the two when they want. The outside-in solution is even compatible with Steam lighthouses and accessories. On top of that, it's compatible with over 1,700 games and experiences on the Steam store, so you won't be lacking in the content department. It also comes with two positionally tracked controllers and built-in speakers. Optional features include optional eye tracking and hand motion support for full immersion sake. It's safe to say that this may be one of the more fully featured headsets out there, but of course the big question will be whether Pimax can truly deliver, especially at its affordable price point. Pimax is aiming to get the first 8K's out by January 2018, and it's also making a more affordable, but still impressive Pimax 5K available at the same time. You can purchase that in the lower reward tiers, from $349, to contribute to the 8K Pimax while also getting something a little special for your contribution.